Hire the A-Team Limo to Carry Around Your Lazy Behind...Sucka! Listen up punk! I've jabbered on about this before, but it looks like you need a little reminder. 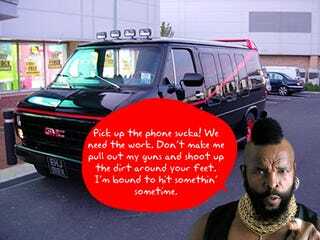 The next time you need a limo to haul that lazy behind of yours around town, hire the A-Team limo service. But if I catch any of you prom kids drinkin' in the back, just remember—I still got two feet, so kickin' you ain't gonna be no problem. And let me tell you somethin'—soldiers of fortune do it up right! Don't believe me fool? Check out what our van is packin' after the break.